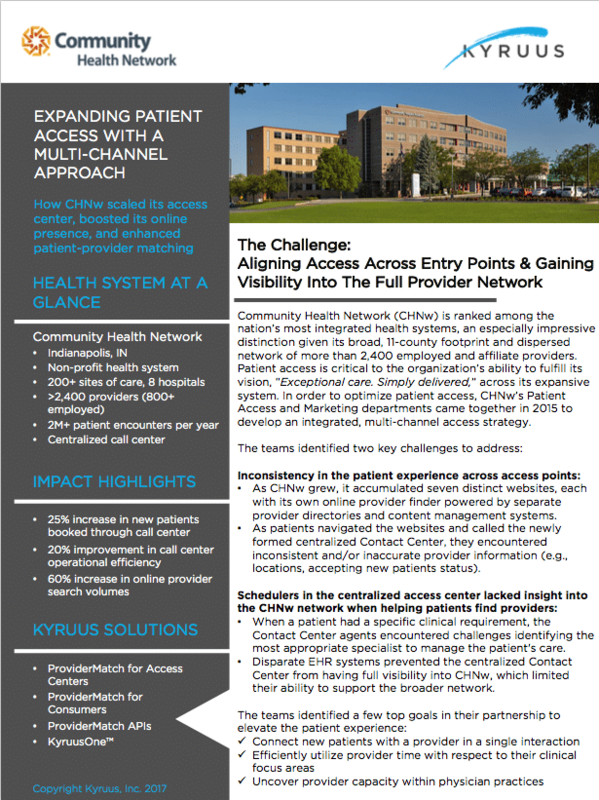 When the marketing and access leaders of Community Health Network, a highly integrated non-profit health system in Indiana, joined forces to develop an integrated patient access strategy, they identified two key challenges to overcome: inconsistency in the patient experience across access points and lack of visibility into providers in the network for agents scheduling patients in the call center. The health system also sought to modernize the online experience it offered patients and facilitate better patient-provider matching to enhance both patient and provider satisfaction. Our greatest challenge was in connecting patients to care. A patient’s experience was variable depending on location, practice, or access point. ProviderMatch enabled us to coordinate care, uncover provider capacity, and meet patient preferences in a single contact.